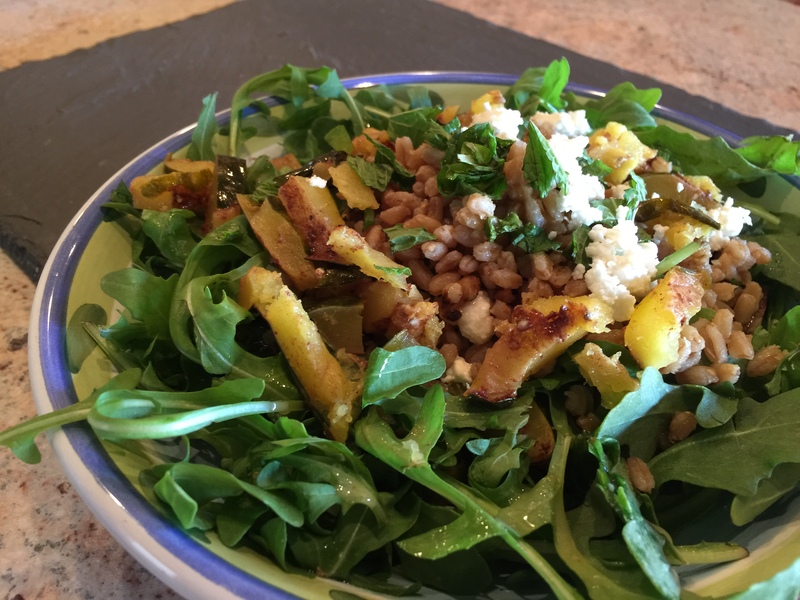 I tried a new recipe from New York Times Cooking, Farro with roasted squash, feta, and mint. My initial reaction is meh. The farro is cooked in apple cider and the roasted squash is roasted with sugar, oil, cayenne, cinnamon, and salt. So the whole thing is too sweet for my taste. Even the addition of feta and arugula did not do enough to tone down the sweet. I have lots of leftovers and I need to figure out a way to change the flavor profile. Most of the folks commenting on the New York Times Cooking site seemed pretty much to love it so I am definitely in the minority. You can find the recipe here. I used acorn squash unpeeled and sliced into rings and I cooked the farro according to America’s Test Kitchen oven method rather than boiling it as the recipe suggested. I served it a little warmer than room temperature on a bed of arugula with the mint and feta on top and dressed the dish with a light vinaigrette. For a vegan rendition omit the feta cheese. This entry was posted in Grains, Vegan, Vegetables, Vegetarian and tagged acorn squash, arugula, farro, Feta cheese, garlic, mint, Vegan, Vegetables, vegetarian. Bookmark the permalink.